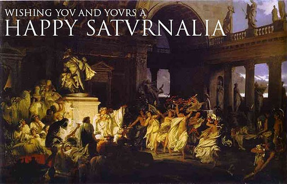 Mortgage Update Los Angeles: SATURNALIA, everyone? If the number of quotes people cite reflects an author's stature in our lives, Shakespeare is in a 3-way battle for top honors with the Bible and Woody Allen. For every "To thine own self be true," and "The meek shall inherit the earth," there's a "I'd never join a country club that would allow a person like me to become a member." Allen voiced one of my favorites in "Take the Money and Run." His 12-year old avatar, already over-flowing with angst, bemoans to a psychologist the futility of doing homework. Woody, "What's the point? The world is going to end." Psychologist, "In 5 billion years!" Ok, so the sun is expected to go nova in 5,000,002,011 AD. I suspect it will be on a Saturday which besides destroying the planet will ruin a perfectly good weekend. True to Woody's spirit, if the sun's upcoming incineration excuses my not finishing my college thesis, my high school calculus homework, my junior high school French project, or my elementary school report on the Civil War strategies, then really, how bad can it be? See! Nothing is all bad. (Excepting the reviews of Julie Taymor's "Spiderman.") In fact, when it comes to the universe, nothing is, well, nothing. Everything connects to and is paired with its opposing twin: creation/destruction, matter/anti-matter, expansion/contraction, positive/negative. To cite Sinatra in the song, "Love and Marriage": "You can't have one without the other." So a nova obliterating a solar system isn't all bad. It forms a black hole, births a new galaxy and creates conditions for life. Joni Mitchell nailed it when she sang, "We are stardust." They sky is an unbounded picture window on the most primordial and powerful forces. Sure, no one likes a meteor crash - just ask any dinosaur - but to watch the Perseids meteor shower each August is to witness remnants from the beginnings of our solar system and, with a little imaginative extrapolation, the origin of the universe. A screen writing mantra is "Show, don't tell." Since I can't say enough about the mind-bending sights in the universe, I offer the most exquisite object in our heavens: Saturn. Saturn accounts for one of the most thrilling moments in my lifetime. In 1985, mucking about with a small telescope, I chanced upon the planet, framed with its vibrant rings, dead center in the eyepiece. In my eyepiece, the majestic and I paired for that moment. I'm sure many of you are fascinated by Saturn. If you are, I have a treat for you. For those who aren't, let me invite you into my world. See why I am so passionate in this video, literally out of this world. I think it may prove as wondrous to you as it is to me even after my 20th viewing. The Cassini spacecraft, launched in 1997, entered Saturn's orbit in 2004. Recently NASA/JPL condensed several thousand images into a 2 minute movie. Watch it at: http://apod.nasa.gov/apod/ap110315.html You arrive at Saturn, glide through the rings, then slip past the moons. No computer simulations or animation. Real light. Real color. Real, Real, REAL! And if that doesn't get you to like Saturn, how about because it's named after the Titan who stands for bacchanalia, festivals, parties, revelry and orgies. Really, how bad can it be? The last word on space belongs to Woody. "According to modern astronomers, space is finite. This is a very comforting thought - particularly for people who can never remember where they have left things." And the last word on my writing also belongs to Woody. "God is silent. Now if only man would shut up."